SOMERVILLE -- Second-half goals scored on gorgeous shots by senior Ali Maxwell (Exeter, NH) and sophomore Alix Michael (Mercer Island, WA) gave the Tufts University women's soccer team a 2-0 victory against 13th ranked Wheaton College in non-conference play Wednesday afternoon at Kraft Field. Tufts improved to 2-2 with its second consecutive victory against Wheaton by a 2-0 score. The loss is the first of the season for the visiting Lyons, who fell to 7-1 overall. The Jumbo defense was the first to keep Wheaton off the scoreboard this year. Keepers Kate Minnehan (Hopkinton, NH) for Tufts and Lindsay Leddy (Warwick, RI) for Wheaton each made two saves in the first half as the teams went to the break tied at 0-0. Wheaton generated four total shots to Tufts' three, while the corner kicks were tied at one apiece through the first 45 minutes. Minnehan made two saves early in the second half before Tufts gained the advantage. In the 55th minute, Maxwell chipped a pass from classmate Cara Cadigan (Nahant, MA) over Leddy from outside the box giving the Jumbos a 1-0 lead. Less than 10 minutes later, the Jumbos scored on the game's next shot. Michael took a pass from junior Sarah Nolet (Los Altos, CA) and ripped a shot from 30 yards out to give Tufts 2-0 insurance. A Wheaton shot by junior Alessia Viscomi (Newton, MA) was saved by Minnehan a minute later, and the visitors would have the next two scoring attempts to no avail. Tufts' Jesslyn Jamison (Berkeley, CA) hit the post as the clock wound down under 10 minutes. It was the second post of the afternoon by the Jumbos, with Nolet's header late in the first half also clanking. Wheaton finished with an 11-9 advantage in shots, but Minnehan's five saves earned her a second shutout of the season. Leddy made two saves for Wheaton. 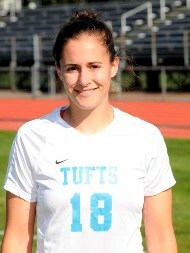 The final corners tally was 2-2, while the physically-contested match saw Tufts whistled for 11 fouls and Wheaton six. Tufts next plays a NESCAC match at Wesleyan on Saturday, while Wheaton travels for a NEWMAC contest that day at Mount Holyoke.